A very famous climber was once asked “Why do you want to climb Mount Everest?” George Mallory’s response reflects the attitudes of almost all mountaineers in the nearly century since his death, “Because it’s there.” We still don’t know if he made it to the top of Everest before Hillary; perhaps, we will never know. What we do know is that the call of the mountain remains as intensely powerful now as in 1924 when Mallory disappeared a few hundred feet from the top of his chosen summit. Although, mountaineering is comprised of essentially four spheres, rock climbing is where, after trekking, many begin; this hobby presents some of the most challenging features of mountaineering, but in the beginning, it can be approached in an indoor climbing facility on a climbing wall or at a not-too-distant boulder with locations in several states. There are several styles of rock climbing, all of which should be of interest to the beginner, who is contemplating how to start and where all of this will take him. The goal can be as wide or varied as the dreams of the beginner. Bouldering emphasizes strength. The dynamics of the climb is the focus, connecting the moves of the climber up a short face of rock. Bouldering difficulties can often be quite extreme as well as technical. Instead of facing the impediments of hundreds of feet, the climber’s problems are condensed into as few as five or ten moves, but the individual’s power and technique are of prime consequence. Interestingly, boulder routes are commonly alluded to as “problems” because the character of the effort sometimes includes artificial restrictions making it necessary to achieve a solution. Normally, the climber is unroped and close enough to the ground to jump down if necessary. Additionally, a crash pad or a bouldering mat is laid on the ground to break a fall. Moreover, one or more spotters work with the climber from ground level to assist in breaking a fall. This form of rock climbing has been increasing in popularity since the 1990s when indoor climbing gyms began burgeoning throughout the United States and Europe. Another reason for its newfound vogue is the limited amount of equipment needed. Often shoes, a chalk bag and the mat are sufficient beginning apparatus. The addition of one or more brushes to clean holds and sports tape for resulting cuts and blisters can be helpful. Before looking at other types of climbing, there is a preparatory skill needed: toproping. It can now be learned in an indoor climbing gym rather than on the rock, but before beginning, several pieces of gear as well as an explanation of their use are required: climbing shoes, a climbing harness, a carabiner, a belaying device as well as a chalk bag, chalk and a climbing rope. Climbing shoes have a sticky rubber sole and rand. The rand is the toe box as well as the heel. These shoes should fit tight but remain comfortable. Because of less steep routes attempted, the general requirement for a beginner is a mild last; it is considerably flatter offering a more relaxed fit and a larger toe-box. Choosing a climbing harness involves knowing something about future goals. A well-padded harness may be the choice for longer climbs, but a lighter weight harness may be preferred for shorter, more intense efforts. One of the most important aspects of the harness is the buckling mechanism; the climber must learn that mechanism for both his and his partner’s harness. Carabiners are metal rings with spring-loaded openings; the preferred ones are locking and are often used as an anchor for a belaying device. The belayer is a partner who controls the rope of the climber from below by means of friction in an attempt to arrest any fall of the climber. Now, the discussion about toproping can begin. The climbing rope should be run through a locking carabiner and attached to a solid anchor. The climber now ties into one end of the rope, and the belayer pulls the rope taut from the other end. When the climber achieves the top, the belayer ties off the rope and the climber leans back into it. Now, the climber walks off the cliff backwards. This is toproping. 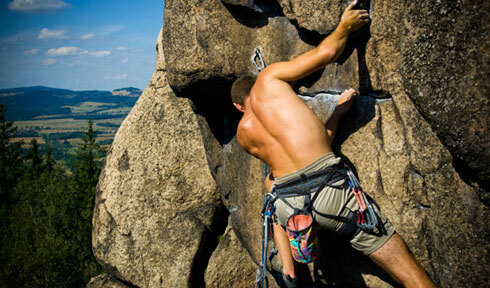 Before beginning traditional rock climbing, one additional skill is needed. Free climbing is done without using equipment in the upward motion. Arms, hands and other body parts can be used, but the equipment is for protection only. The climber must be honest enough to lead a climb without having seen another climber establish the same route. When the climb is onsighted, the climber has reached the top without falling or using gear; if these criteria are not met, the climber has to start over. With these skills and the necessary equipment, the beginner can think about traditional climbing. In traditional climbing or “trad” climbing, climbers use gear for protection. In the last 40 years, this protective gear has increased climbing safety and fueled the sport’s popularity. Nuts that are wedged into cracks in the rock but removed at the end of the climb are one example. There are several other examples such as slings, spring loaded camming devices and tricams. Spring loaded camming devices, also called “friends”, consist of three or four rotating wheels mounted on a single axle forcing the cams apart. When the cams are together, they are inserted into a pocket in the rock, but as the trigger is pulled the cams expand. A climbing rope is attached to a sling and a carabiner so that a pull on the rope exerts outward pressure on the rock. If a climber falls, he pulls on the rope and the friction helps stop his fall. Finally, a tricam is a piece of aluminium attached to webbing, inserted into a crack in the rock, allowing the climber to grip the rock tightly. Normally, it is not as easy to remove as a “friend”, but is more trustworthy in a mountain environment because there are no moving parts that will freeze. A more advanced type of rock climbing is aid climbing which is very difficult and sometimes involves staying on the rock for several days. Massive amounts of gear may be involved requiring technical expertise and knowledge acquired from many previous climbs. In addition to this dangerous effort and certainly not for the beginning is solo climbing which means climbing without any kind of protection with the exception of the trusty rope. One final adventure which, hopefully, does not portend the “irreversible” bold and risky undertaking is mountain climbing in the alpine environment. Here not only is technique and experience important but the elements play a large part; ice covered slopes, glaciers, crevasses, nasty weather and avalanches are all part of the experience. This may be adventure and sport, but it can also be a profession. One can not only climb the mountain but one may strive to teach others offering training, certification and guiding. This may be the ultimate goal for the beginner who discovered the short boulder at his or her local rock climbing gym. There are at least two important organizations to be consulted concerning mountaineering depending on location. First is the American Mountain Guide’s Association (AMGA) which is the ultimate source of information in the United States. It supports high standards for professional guiding and climbing instruction operating within a powerful tradition of respect for “the” mountain. On a worldwide basis, the Union Internationale des Associations d’Alpinisme or UIAA is the governing body for climbing. It concerns itself with issues such as access, medical oversight, environmental protection and climber safety; it has administrative offices in Bern, Switzerland. Both organizations have extensive Internet presence and are easily found. For each type of climbing discussed here, appropriate and complete instruction is absolutely essential. Find a local climbing school; this is probably easiest through a climbing gym, but absent that go to the Internet for information on availability. Look at it this way: good training and a good partner may very well save your life. In the meantime, the appetite for this challenging sport has no doubt been whetted. Pursue it and explore the dream.